Click the button below for samples from our latest album. 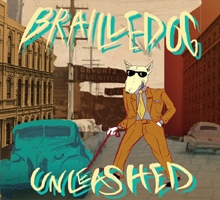 Brailledog IS Unleashed! We’re so excited to be able to present to you our debut recordings. Hope you enjoy them as much as we enjoyed preparing them for you. James, Scott, Dennis and Glen hope you’ll use this site as an easy link to all things Brailledog.